We at Pointwise love working with students and Stanford’s Solar Car is one great example of why. Image from The Stanford Daily. Click image for article. Altair challenges you to begin using CFD in the cloud. Their HPC Cloud Challenge will award selected applicants with software, support, and access to their HyperWorks Unlimited Virtual Appliance. See the details here. Symscape’s newsletter for July 2015 has been published. Not CFD but still should be interesting to this audience: he new blog Maker Engineer. Read Intelligent Light‘s summary of AIAA Aviation 2015 and watch the video of their award-winning animation. Surface pressure on a bluefin tuna computed using SC/Tetra. Analysis by Kinki University. Image from Software Cradle. See link below. Researchers at Kinki University used SC/Tetra to study drag forces on a bluefin tuna to learn more about the fish’s ability to swim at over 50 mph. 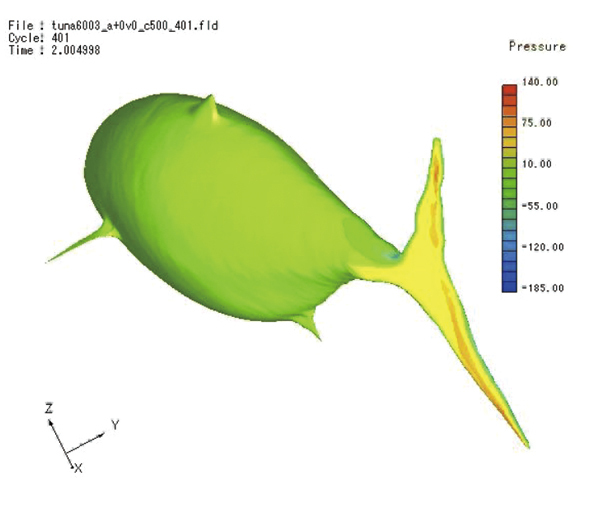 Read how CFD will be used to understand in detail the performance of industrial blowers. CFD for lowering the drag coefficient of automobiles to 0.2. Friendship Systems released CAESES 4.0 (formerly Friendship Framework) for modeling and optimization. In addition to the rebranding, the software has an updated GUI and an accompanying free version, CAESES Free. Engys released HELYX-OS v2.3.0, the open source GUI for OpenFOAM. 3MF is a proposed, next-generation file format for 3D printing. But because the de facto standard STL file is also widely used as a geometry definition we need to consider how 3MF will impact us. When you have 50 minutes to spare, spend it with this video on The Finer Points of Meshing in Autodesk Simulation CFD. Click image for video. ERCOFTAC is hosting a 2-day course on Best Practices for Engineering CFD in Munich on 22-23 October 2015. The AIAA’s 6th CFD Drag Prediction Workshop will be held next summer in Washington, DC in conjunction with the AIAA Aviation Forum and Expo. The Collaboration and Interoperability Congress 2015 will be held in conjunction with CIMdata’s PLM Roadmap for the Aerospace and Defense on 28-29 October in Chantilly, Virginia. Sometimes it’s hard to remember that not all abstract painting utilizes grids, geometry, faceting, reticulation and other mesh-like features. Fluid dynamicists should never forget that painters have extensive, applied expertise with fluids – specifically paint. They often mix their own paints using esoteric materials (Rothko used eggs) to obtain the properties they need to express their ideas. You may recall an article cited here a few years ago about Jackson Pollock’s exploitation of the fluid properties of paint. Take for instance painter David Alfaro Siqueiros and his work Collective Suicide. David Alfaro Siqueiros, Collective Suicide, 1936. Click image for source. 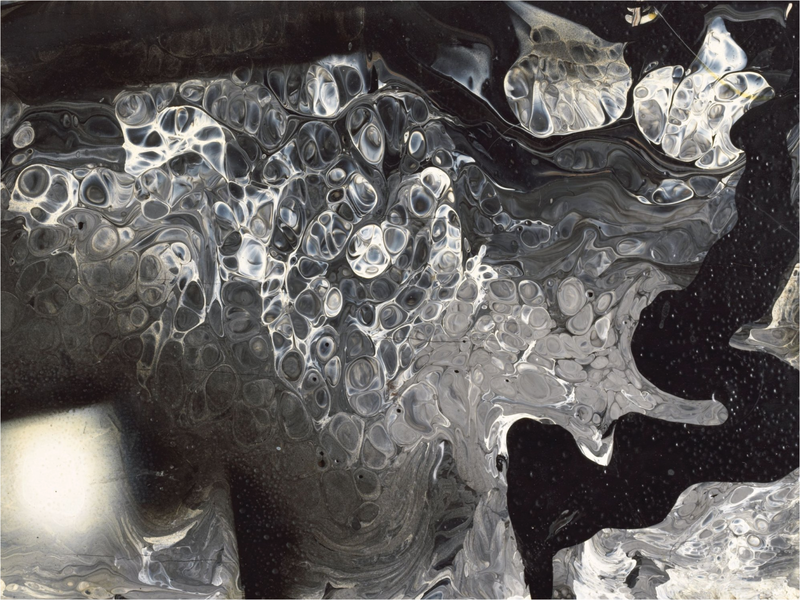 We read in a research paper by Zetina et al (A Hydrodynamic Instability Is Used to Create Aesthetically Appealing Patterns in Painting) that Siqueiros’ technique of pouring different paints on a horizontal canvas allowed the artist to achieve unique patterns because of the paints’ differing densities and the resulting Rayleigh-Taylor instability. Consider the image below which is a close-up of a portion of Collective Suicide from the bottom, just to the right of center. Closeup of Siqueiros’ Collective Suicide showing the mixing of black and white paints. Image from Zetina’s article cited and linked above. The researchers believe that this technical insight into the technique will help future painters but will also be of great assistance to art conservationists. This entry was posted in Applications, Events, Hardware, News and tagged Altair, CAESES, CD-adapco, ERCOFTAC, FRIENDSHIP-Framework, Helyx, Intelligent Light, SC/Tetra, Symscape. Bookmark the permalink.